If you love listening to music you've accumulated on your computer, you can listen to all of it in your car as long as you have a USB port. If your head unit in your car already has a USB port built right in, then it makes it even easier to start listening to music while you drive. The main reason that car stereos include USB ports is to provide a data connection for digital music files, although there are a few roadblocks that you might run into along the way. On the other hand, if car doesn’t have a USB port, then you’ll need some additional hardware before you can listen to music in your car from a USB flash drive. Connecting a USB flash drive to a head unit USB port is literally a plug and play type of situation. There’s a chance that you could simply dump some music onto your drive, hook it up, and have everything work. If everything doesn’t work right out of the box, then there are a handful of compatibility issues to check out. The first thing to look at is a file format, which refers to the way that your music files are encoded. 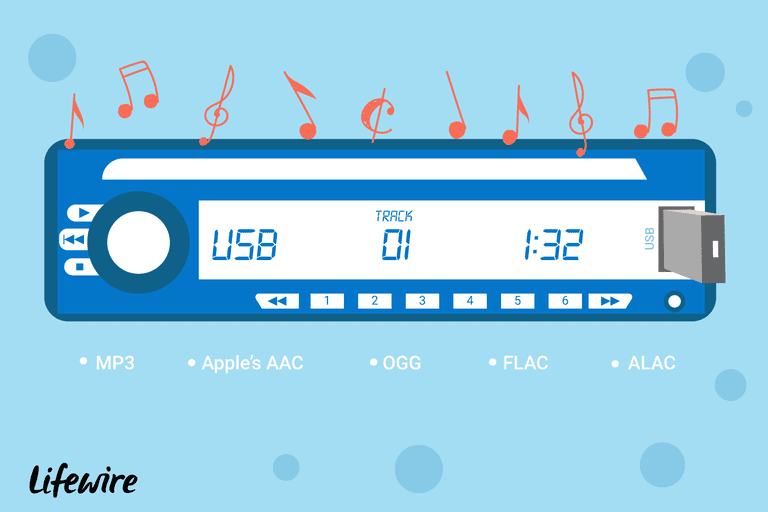 Common digital music file formats include the ubiquitous MP3, Apple’s AAC, and open source OGG, but there are much more. There are even high-resolution audio formats like FLAC and ALAC, although there is a limit to how many of these large files you can take with you on the road. If your digital music files are encoded in a format that your car stereo doesn’t recognize, then it won’t play them. So if you plug a USB flash drive into your head unit and nothing happens, that’s the first thing to check. The easiest solution is to find the owner’s manual for the head unit to see what types of files it can play, and then compare that list to the actual file types on the USB drive. If a manual isn’t easily available, the same information should be available via the manufacturer’s website. Another primary issue with successfully connecting a USB drive to a head unit is the way that the drive is formatted. If the drive itself isn’t formatted in such a way that the head unit can actually read information from it, then nothing will happen when you plug it in. For instance, if the head unit is looking for an FAT32 file system and your USB stick is NTFS, then you’ll have to reformat the drive, put the music files back on, and then try again. Formatting a USB flash drive isn’t difficult, although it is important to determine the type of file system your head unit can read and then make certain that you select the correct drive to format. If your music isn’t backed up anywhere else, you should also do that first, as formatting the flash drive will eradicate any files that you had stored on it. If changing file systems is something you’ve never dealt with before, you may want to check out more information about formatting a drive on a Windows PC, or formatting on Apple OSX. The last common issue that can prevent you from listening to music in your car from a USB drive is if the head unit is looking for the files in the wrong place. Some head units are capable of scanning the entire drive, while others provide you with a rudimentary file browser to locate files on the drive. But, there are some head units that make you look in a very specific place. If your head unit only looks for music files in a specific directory, then you will have to determine what that directory is by checking the owner’s manual or visiting the manufacturer’s website. You will then have to create the appropriate directory on the drive and move all of the music files into it. After that, the head unit should be able to locate the music files without a problem. All of the preceding information presupposes that your head unit already has a USB port and is capable of playing digital music files via that port. While upgrading to such a head unit isn’t as costly as it once was, there are alternative methods that will allow you to listen to music from a USB drive in your car for a very small investment of time or money. If your car doesn’t have that capability already, you will need to add a USB port to your car stereo system in some way. The easiest option is to use an FM transmitter that includes both a USB port and the appropriate hardware to read and play music files. These features aren’t found in every FM transmitter, so it’s important to check the fine print before buying. While FM transmitters don’t provide the best audio quality in the world, and they often won’t work at all if the FM band is too congested with powerful signals, they are exceedingly easy to use. A slightly better option, in terms of sound quality, is to wire in an FM modulator, although this will typically provide you with an auxiliary port rather than a functioning USB port. With an FM modulator or a head unit that includes a built-in auxiliary port, the missing piece of the puzzle is hardware or software that is capable of decoding the digital music files and playing them back. This can come in the form of a dedicated MP3 player or a phone, but there are also inexpensive solutions out there that are essentially just an MP3 decoder on a board with a USB connection, aux output, and power leads, that provide something of a do it yourself alternative to actually replacing your head unit.